Compact, light and convenient. Perfect Trekkers cookset. I bought this a couple of years ago and fell in love with it! I'm able to pack my entire cooking setup without sacrificing more space in my pack! Everything nestles inside of itself nicely! What I like: Packable, lightweight 2 insulated cups with lids (I can finally leave the mug at home), 2 eating bowls, All plastic is BPA free! Strainer on pot lid, Integrated rubber handle (leave pot gripper at home). What I don't like: Flimsy and hard to clean spork. I replaced these with a Light My Fire utensil. Rubber handle can melt from larger stoves Wish I could store 2 canisters with my stove. All in all, I'll be buying more product from GSI in the future. I have my eyes on the Minimalist! lightweight, durable, and great for backpacking. Almost everything is thought of in this cook system for two. Great cooking time and equal heat distribution. 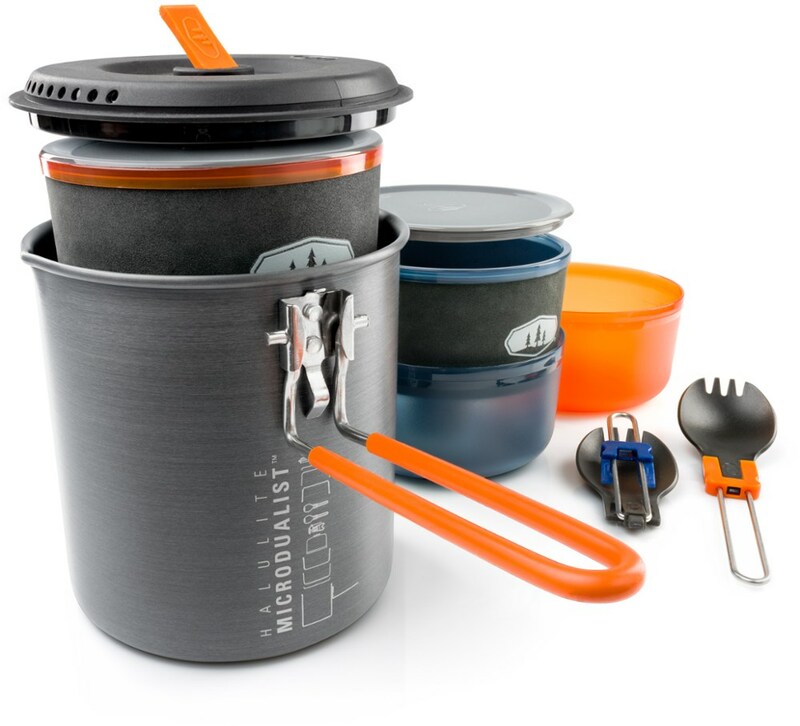 Packs all within itself including two bowls sporks lids fuel can and outside cover doubles as a wash bowl for cleaning afterwards. It cools down quickly after use. I love that if I stop for a hot lunch i can repack it quickly and get back on the trail. Crush proof, heat-resistant, nylon lid and silicone ring will not deform in packs and includes an integrated strainer. Convenient folding handle locks into place for cooking and secures entire set for transport. Unique bowl + mug solution with low center of gravity and Sip-It lid virtually eliminate spills while the insulating sleeve keeps your drinks hot. Ingenious, welded stuff sack holds set while traveling and doubles as a sink or wash basin in camp. 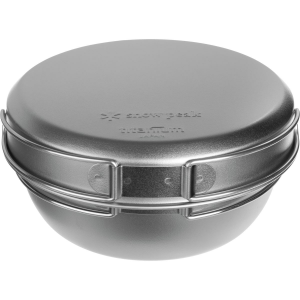 Light enough to throw in your pack and not worry about needing any other cookware. 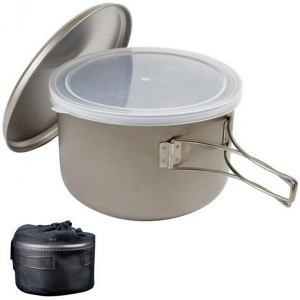 The main cooking pot is the perfect size for two people. 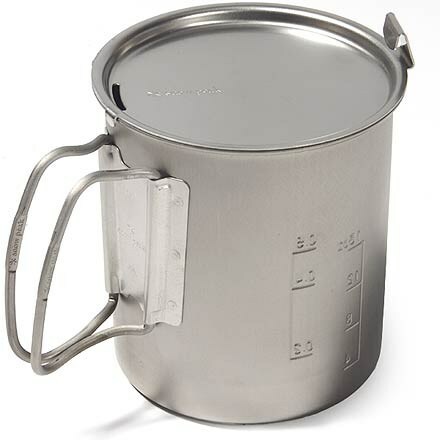 When boiling water for Ramen, coffee, or a couple of MRE meals, the 1.4 Liter Halulite cooking pot does the trick and allows you to boil enough for two people at the same time. I bought my set about a year ago and it has been used heavily with no issues other than the foons not holding up. I strongly recommend this set to anyone looking to cook for multiple mouths on any camping adventure. My 10yo son thinks the "Foon" is really cool. So I gave it to him to keep! 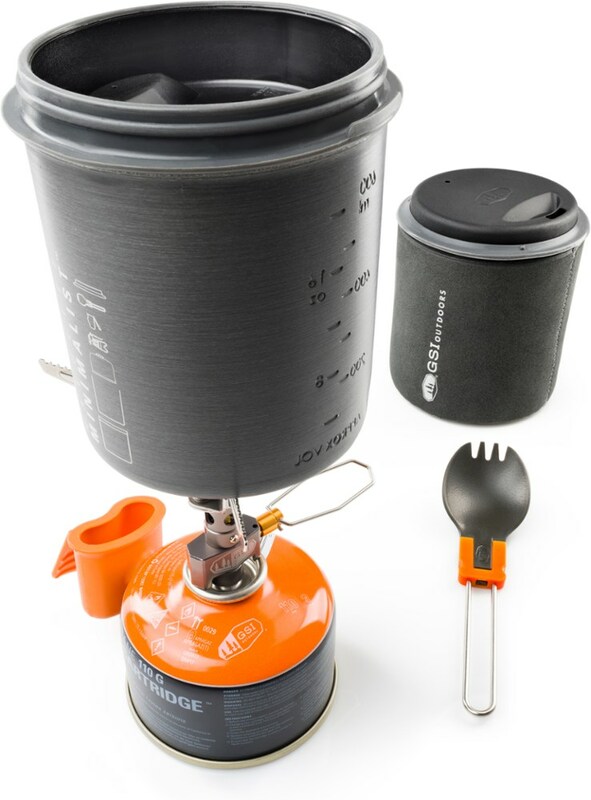 This cookset is perfect to take along on any camping/backpacking trip. Bought this for my son just prior to leaving on an overnight backpacking adventure -- he loved it! Worked perfectly for him to cook his meals. He liked how easy it was to clean before moving on to his hot cocoa after dinner. 5 stars for functionable, lightweight, ease of use, durable, packable. Easy to use, easy to pack, fits more than you'd think in it (2 sporks, paper towels, MSR burner and lighter, tiniest IsoPropo tank, maybe room for more). 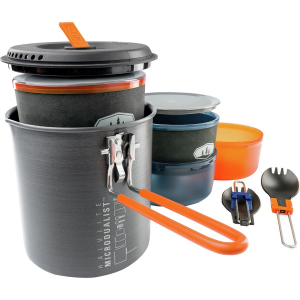 I had a lot of trouble deciding between JetBoil and MSR MicroRocket and a cookware set- glad I chose the MSR/ GSI MicroDualist combo. I just camped with 2 Jetboil fans/ users and they liked my setup better. 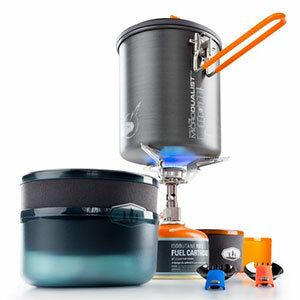 Not knocking JetBoil — looks like a great stove and cookware as well. Bowls work great, mug/bowls work great, even the sporks (2 included) work good. I packed a tougher looking spork for my last camping trip and never used it. After a summer of use - not one complaint! Great product for 2-up camping. Perfect size and very well made. Great alternative to Ti cooksets. Very easy to understand and use. I can fit my alcohol stove, fuel, teabags and salt/pepper in here, too. Seems to be very well made. I haven't used this in the field yet, but I have tested it out at home.